Google Search Console is a free service offered by Google that helps webmasters monitor and maintain their site's presence in Google Search results. Search Console helps users understand how Google views their site and allows them to optimize their performance in search results. Search Console’s Search Analytics feature shows webmasters how often their site appears in Google search results for various keywords. This data is extremely powerful but currently lives in Search Console’s Search Analytics Report and is hard to combine with other data sources. Today we are announcing a new Data Studio connector for Search Console. With this launch users can pull their data into Data Studio to build reports that include impressions, clicks, and average position broken out by keyword, date, country, and device. 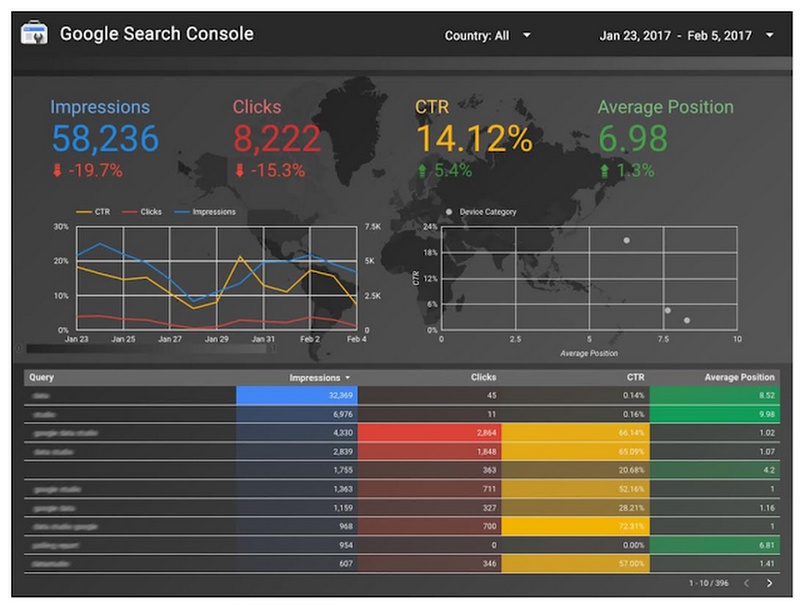 Search Console users can now build Data Studio reports to understand how their search traffic changes over time, where traffic is coming from, and what search queries are most likely to drive traffic to their sites. Users can also filter reports for mobile traffic to improve mobile targeting, and to analyze clickthrough rates for various organic search terms. As always, Data Studio report creators can add components from other data sources into a single report. With this new connector, users can use the Search Console and AdWords connectors to compare performance across paid and organic search, or add Google Analytics data to analyze site-side performance. Note that Search Console metrics can be aggregated by either site or by page (URL). This is configured in the Data Source creation flow, where users can select either “Site Impression” or “URL Impression”. To learn more about the distinction between these two methods please see the Search Analytics Report Help Center article. Want to learn more? Looking for a new connector in Data Studio? To learn more about the new Search Console connector, please visit our Help Center or post your questions in the Data Studio community forums. Is there a specific data service you wish to be able to access and visualize through Data Studio? We welcome your feedback via the connector feedback form — we read all responses and use them to prioritize new connectors.